Sr. Josefina Sauleda Paulis (1885-1936), baptized with the name of Buenaventura, whose family came from San Pol de Mar (Barcelona, Spain). The Sauleda Paulis family was deeply Christian and equally deeply Catalan. The family was of a high social position and Buenaventura's father was the owner of a textile factory. The couple had twelve children, and our protagonist was the tenth. The small "Ventureta", as she was familiarly known, received a serious Christian formation, which she completed with a humanistic education corresponding to her social status, according to the custom of the time. She attended the school of the Dominican Sisters of the Annunciation of the town, also receiving a training in music. 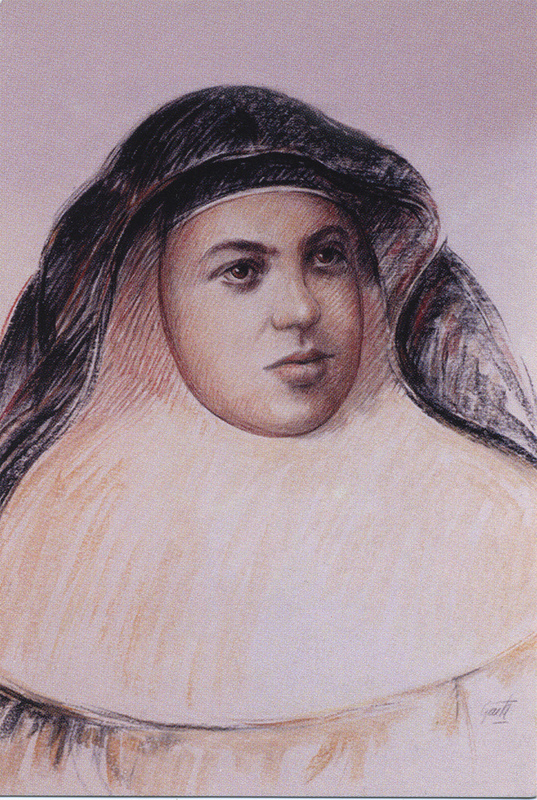 When choosing a state, she opted for religious life, although she was undecided whether to dedicate herself to active life in an institution dedicated to works of charity, for which she had exceptional qualities, or to consecrate herself to the contemplative life in enclosure, which represents another dimension of the sublime virtue of charity. After deep reflection in a few days of spiritual retreat, duly advised, she decided to apply for admission to the Monastery of Our Lady of Monte Sion, of the Dominican Order, where years before her elder sister Mercedes had made profession. On January 19, 1905, the young Buenaventura Sauleda crossed the cloister door of the Monastery, from which she would only leave to go to martyrdom. She was 24 years old. On reception of the Dominican habit she took the name of Sr. Josefina. Sr. Josefina was a woman of spirit and strong character, efficient and kind, of a well-defined spirituality, warmly human and perfumed by fraternal love; she was an instrument of peace and coexistence in the internal life of the monastery. Prioress for two consecutive 3-year terms, in 1935 she was named Novice Mistress. She did not lack occasions to demonstrate and perfect her personal qualities. But where she gave the definitive note of her life and religious personality was during the religious persecution of 1936. Her firmness before martyrdom impressed her persecutors. Mother Sauleda left her mark. On July 21 the Monastery was assaulted and the church burned down. The nuns had to see from the outside as the flames devoured the alters and works of art of the church, leaving only the walls burned, while uncontrolled masses were ripping the inside of the convent building. They had to get used to the idea that there was no point in thinking about going back, therefore it was essential, and with a sense of urgency, to find suitable accommodation for all the nuns. The Prioress, elderly and disoriented at what she had had to do, was not the most appropriate person to carry out the necessary steps and place all the nuns in places suitable for them, in those dramatic and dangerous circumstances. The responsibility fell on Sr. Josefina. For the nuns who had family in the city and nearby towns, there was no problem. But there remained the little group of novices, of nuns from outside Barcelona, along with the old and sick or disabled. Only God knows what steps she had to take, and what she had to do without financial means. Even knowing that she was known and persecuted, she did not flinch. She endured contempt and scorn, seeing how the doors were closed, because her presence would compromise those who would give her and her and the other sisters shelter. Undaunted and sure of God's help, she did not stop until she managed to put the nuns in a safe place. Charity and self-denial had given the highest note.Only when she finished finding shelter for the entire Community could think about going to her relatives who were waiting for her in San Pol de Mar. She was then denounced and arrested. It was August 31, 1936. A new ordeal began that lasted half a day, based on constant interrogations with no more help than a glass of water, but which she endured with a stoicism that only a charity without limits can propitiate. She did not reveal any secrets and nobody was harmed. At night they took her away, and in the early hours of September 1st her body was found, her face disfigured, but she could be identified and picked up by her relatives. For history it is a mystery what Sister Josefina Sauleda suffered that night. We know that only words of forgiveness came from her. She said on other occasions that she would consider her soul happy if she deserved the palm of martyrdom. The Lord had it ready for her. Sr. Josefina Sauleda received the martyr's crown, and the Church ratified it. She was beatified in Rome on October 28, 2007, the first contemplative Dominican nun of Spain. Together with her, was beatified 74 martyrs, members of the Dominican Family, within the group of 498 twentieth-century martyrs in Spain, beatified on the same day. On June 21, 2006, at 94 years of age, the exile of Sister Maria Petra (Nicoletta) Giordano, a Dominican nun, ended. She had spent 72 years of her life inside the monastery to seek in prayer an ever greater union of love with Our Lord. Her existence, precious in the eyes of God, did not go unnoticed in the eyes of those who had the privilege of knowing her and of appreciating her journey towards the attainment of evangelical perfection. Nicoletta Giordano was born in Naples on 4 July 1912, the eldest daughter of nine children. Her father, Luigi, had a company with 350 workers. In 1927 the family had a difficult time since Mr. Luigi did not want to enroll in the National Fascist Party. The whole family moved to Rome where Luigi accepted a job as a shop assistant. In the family Nicoletta was always obedient, did not fight with her brothers and sisters and never spoke badly about others. She was very lively, but she also loved quiet games. From an early age, she began playing the piano and liked to sing. Because of her mother's infirmity, she had to provide for her younger brothers and sisters. But she did not neglect her Christian commitment and the care of her spiritual life, so much that she became a "Daughter of Mary" and then a Dominican Tertiary at the Dominican Basilica of Santa Maria sopra Minerva Moreover, she collaborated assiduously in the parish activities. Although very young, she was often called to the bedside of the dying and managed to make some sinners reconcile with God. At about twenty years of age, she attached herself to the Heart of Christ with a vow of to be a victim. She soon began to develop a strong attraction for religious life and, in particular, for Dominican spirituality. At first she was prevented in making this choice because of her family duties. Finally, after her twenty-second birthday, on 4 November 1934, she went to the Monastery of Bibbiena, Arezzo, near the Sanctuary of Santa Maria del Sasso to give herself to a life of contemplation. She made her First Profession on May 4, 1936 and her Solemn Profession on May 11, 1939. Within the community she held important offices, always attracting the admiration of sisters and superiors; in particular, she was novice mistress, prioress of the monastery and also a member of the Commission for the updating of the Constitutions after the Second Vatican Council. Sister Petra Giordano was a person "attracted by Christ and his divine beauty". Her seven decades of cloistered life were marked by a tireless journey towards "perfection", which meant for Sister Petra "to aim for only one thing: complete transformation into Jesus". For twenty-five years she was novice mistress, and she was a prioress of the monastery several times. She knew how to embroider and paint, she was jovial and affable, but above all she was able to write elevated spiritual thoughts and reflections. They were born from her heart and from entrusting herself completely to the Father. In many notebooks and writings she speaks of solitude, of doubts, of suffering, of pain, however, capable of transforming them into gifts, acts of love, into "Alleluia". Her resolutions are summarized on a sheet of paper, pursued with tenacity. "To die before lacking in charity; always act with simplicity; always give a good example; remember that the best are those who recognize their imperfections; tend not to the easiest, but the most difficult; to savor everything, to have no taste for anything "are just a few fragments of a lesson that goes beyond the walls of a monastery; they are an example of a way of holiness indicated to every person. After a life spent in punctual observance of her state in life, she died on June 21, 2006. O Jesus you said: "Come to me, all of you who are weary and oppressed and I will refresh you." Through the intercession of Mary Our Mother glorifies on earth the humble servant Sister Petra and makes me obtain from heaven the grace of which I need. Recite three Glory to the Father. If you receive thanks from the intercession of the Servant of God, Sister Petra Giordano, please inform the Monastery. Mother Teresa of the Child Jesus, in the world Felisa Pérez de Iriarte y Casado, daughter of Gumersindo and Magdalena, was born on May 2, 1904, in the Navarrese village of Eslava, Spain, in a simple and humble family of farmers who were deeply Christian. She was the youngest of 5 children. The day after her birth she received Holy Baptism, and was confirmed a few weeks later. When she reached school age she attended the School of the Daughters of the Cross, where she made she First Communion on November 21, 1911. In her youth she joined her friends in the parish tasks, she frequented the formation courses, she sang with the Auroros early on Saturdays and she made a pilgrimage every year to the Virgin of Ujué. She helped her father in the field tasks. Gifted with a beautiful voice, standing on the threshing floor, she happily accompanied the work with her songs, calling the attention of passers-by, whom she greeted with her unparalleled smile. Arriving at the age of adulthood it was time to decide her vocation. On the day of her First Communion she made the intention to follow Jesus Christ forever, but the clear decision had to mature over the years. Although in appearance her temperament seemed more suitable for the active life, she was always very clear that the call of the Lord impelled her to the contemplative life in strict enclosure. She said it several times with particular firmness: "I am meant to be enclosed, well enclosed," until the end of her life, always distinguishing herself for her love of enclosure. On January 4, 1924 she entered the Monastery of Our Lady of the Rosary of Dominica de Daroca (Zaragoza). After the time of postulancy she received the habit of the Dominican Order and completed the year of canonical novitiate, making Profession of temporary vows on July 2, 1926 and three years later signed her definitive consecration with Solemn Profession. Her religious profession consecrated her with the name of Sister Therese of the Child Jesus forever, which she chose because of the deep admiration she felt for the Saint of Lisieux, identifying with her victim orientation and following her spirituality, which she fully assimilated. The years as a nun in Daroca were years of fullness and generosity and were distinguished by an attitude of constant service, assuming with exceptional efficiency the various positions that obedience entrusted to her. She practiced almost all the Offices of the Community except for Prioress, Sub-prioress and Novice Mistress. She stood out as a chantress and mostly served as the "Turn Sister" (portress) a position that demands great prudence and deep interior life. Her availability, always ready to do good, coupled with a will that was unaware of the concessions to mediocrity, constituted the qualities that animated her spirit to glorify God and serve her neighbor. Faithful to her offering to the Lord as a victim for priests, she reached a heroic degree of virtue. When she least expected it, Sister Teresita began a new path, in which she was soon able to demonstrate the greatness of her interior life well known by God but veiled to men. The need arose for the reform or renovation of Olmedo's "Madre de Dios" Monastery, which declined because of the small number of very elderly nuns in which it was very difficult to introduce changes to improve it and much harder still to eliminate faults. At the request of the Bishop of Ávila, on whose jurisdiction Olmedo then depended, the Community of Daroca, faithful to its constant willingness to help as it had many times demonstrated, undertook to send to Olmedo two nuns with Sister Therese of the Child Jesus at the head, in the office of Prioress. With the competent ecclesiastical authorization they arrived on January 26, 1953. In Olmedo, Madre Teresita revealed the profound human and Christian dimension of her personality, giving much more than what had been expected of her. In exceptionally difficult situations, she demonstrated her spiritual heights and the heroic degree of her virtues. She won the affection of all the nuns from the oldest to the novices. God gave her one year and nine months of life in this service. While she had great interest in the physical and moral health of the nuns, she was personally careless with her own. It can be said that she was never ill, except for some temporary ailment, that is why she was always reluctant to medical examinations.She was convinced she did not need them. However, her appearance began to show signs that something was wrong. Having to accompany a novice,who was having minor surgery, at the request of her nuns, she underwent a medical examination. The diagnosis was alarming. Cancer had invaded her body and required rapid intervention. Returning to Zaragoza for surgery on September 5, 1954, it was found that there was nothing further medicine could do and on the 17th of the same month she returned to the Monastery of Olmedo, where she died a saintly death on October 14, 1954. Shortly before her death she had said: "Priests have always been my greatest passion." Upon her death, without being notified, numerous priests appeared for whom she had offered her life as a victim, among them many Dominicans who, presided over by the Bishop, officiated at a solemn funeral. Everything suggested that at her death the reform would collapse, but when she said goodbye she said that from heaven it would help them much more than it could have done on earth, prophesying that all the Divine Office would be sung and there would be much glory. to God and to the Order, as has been fulfilled. Her powerful intercession before the Lord is manifested in the constant graces with which her increasingly numerous devotees are favored. Her reputation for sanctity has crossed our borders and has spread to all continents. On April 3, 2009 Pope Benedict XVI recognized her holiness and of her virtues in a heroic degree, declaring her Venerable.The Congregation for the Cause of Saints is studying a possible miracle for her possible beatification.